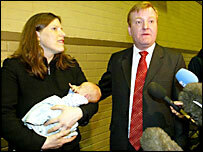 Charles Kennedy has pledged to hold Labour to account as the "real alternative" in the next Parliament. The Lib Dem leader said Labour's reduced majority meant the government could no longer "ride rough-shod" over people's views and instincts. The Tories were relegated to south east England, while the Lib Dems were a national party of the future, he said. Mr Kennedy thanked party workers for helping to achieve victories in 62 seats - the highest since the 1920s. The party fared particularly well against Labour, taking 12 seats, but also lost more seats to the Conservatives than they gained. Of the three main parties, the Lib Dems have seen the biggest rise in their share of the vote. It could reach 23%, up from 18.3% in 2001. Speaking on the steps of his party's headquarters in central London, Mr Kennedy congratulated Tony Blair on achieving a third Labour term. But he warned there were "serious questions for the quality of democracy" when a winner was generated with such a low level of support. He said: "Overall this general election has clearly resulted in a new House of Commons which I think will be healthier in the party political sense than what the last eight years have been. "The government cannot ride rough-shod over people's instincts, people's inspirations and people's views and we will have a major role to play in that. "If you look at where we have gained seats in this election, with a view to the next general election, well-poised to begin the task of providing the real alternative to this Labour government." He also predicted that "when the tide goes out" as it inevitably would with Labour, the Lib Dems would emerge as the credible alternative. Mr Kennedy also dismissed suggestions that he should now rethink polices like higher taxes for the rich and local income taxes to win over Tory voters. Policies like this would serve the Lib Dems well in the longer term, he said. Speaking just after he was returned to his Ross, Skye and Lochaber constituency Mr Kennedy said the era of three-party politics had begun across the UK. Labour has won an historic third term but with a greatly reduced majority - which the BBC predicts will fall from 167 in 2001 to 66. The Conservatives have made a significant step towards recovery, Michael Howard said, but added that he would resign as party leader once the Tories had decided how and when to elect a replacement. BBC political editor Andrew Marr said taking more than 60 seats would represent an "historic moment" for the party. The Lib Dems had their first gain in East Dunbartonshire, before unseating Labour ex-minister Barbara Roche on a 15% swing in Hornsey and Wood Green. The party went on to win constituencies including Birmingham Yardley, Cardiff Central, Manchester Withington and Cambridge from Labour. The Lib Dems have also taken Ceredigion from Plaid Cymru by just 219 votes. Sarah Teather, the youngest MP in the last Parliament at 29, retained the Brent East seat she won for the Lib Dems in a by-election in 2003. However, the party has seen Leicester South, another by-election gain, return to Labour. Meanwhile the Conservatives have taken Newbury, Guildford, Ludlow and Devon West and Torridge from the Lib Dems. The Lib Dems largely failed in their "decapitation" strategy to topple top Tories, with Theresa May, David Davis and Oliver Letwin all holding on to their seats. However, Shadow education secretary Tim Collins was unseated as the Lib Dems took Westmorland and Lonsdale from the Conservatives. Constituencies retained by the Lib Dems include Torbay, which was strongly contested by the Tories, and Cheadle, the country's most marginal seat. The Lib Dems had hoped their stance on issues such as Iraq, tuition fees and local taxation would win over former loyal Labour supporters. At the end of the last Parliament, Labour had 410 MPs, the Conservatives 164 and the Liberal Democrats 54. The Lib Dems won 52 seats in the 2001 election, adding two more with by-election wins in Brent East and Leicester South.